The FIM Road Racing World Championship Grand Prix (MotoGP) is the marquee event for motorcycle road racing fans around the globe. It has a 68-year history and is the longest running world championship for motorsports. As the official commercial and television rights holder for the MotoGP, Barcelona-based Dorna Sports produces and distributes massive amounts of video content throughout the MotoGP season, runs from March to November each year. 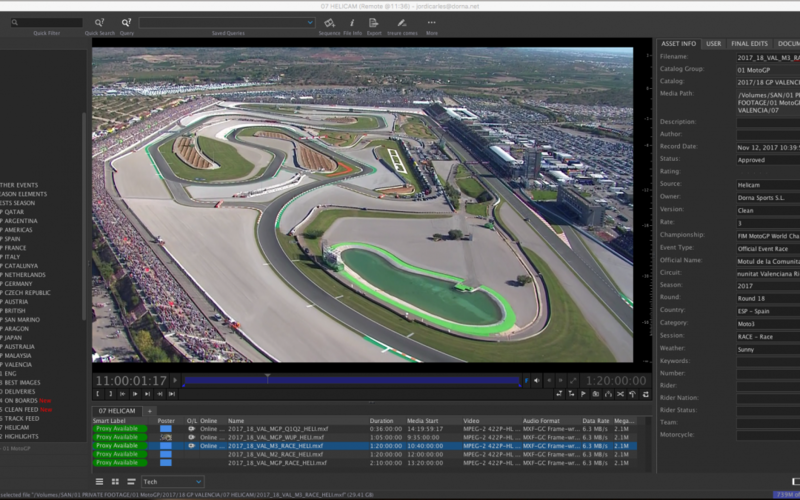 To give a recent example of the value of CatDV, Dorna Sports’ on-the-ground editors in Austria created highlight video from a practice session, which was then transcoded and watermarked by the Telestream Vantage cloud service before being transferred by FileCatalyst according to CatDV’s metadata rules. Carles explained that automation of this process alone has saved the company a full-time position. 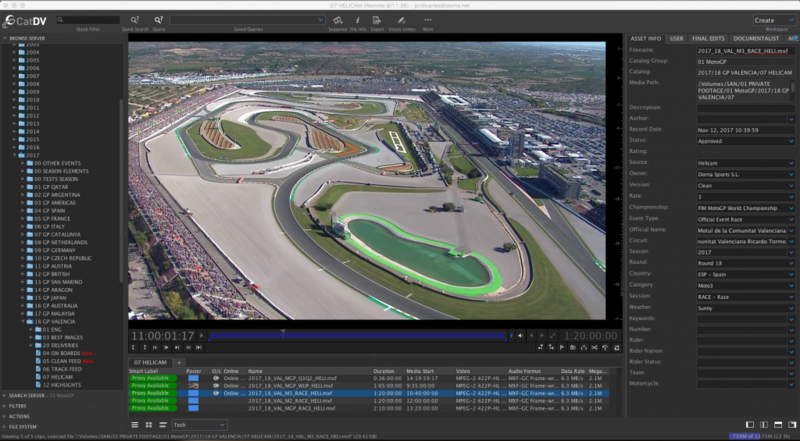 With CatDV, Dorna Sports’ full-time documentalists are able to access the content they need to create engaging new content using CatDV’s creative tools, including its Adobe Premiere panel. 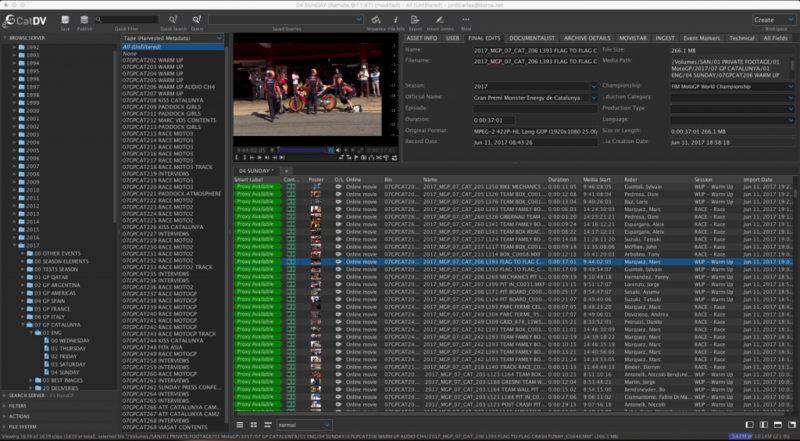 In addition to supervising the automatic ingest of content from the race circuit, the editors tap into additional tape-based video for ingest into CatDV. Since every asset in the MAM system is cataloged by metadata, it’s easy for users to find video clips of specific events, riders, and other topics of interest. The resulting Dorna Sports-branded content is posted to the MotoGP website and used in a multitude of promotional projects, and the clean, non-watermarked video can also be made available for purchase by outside entitites. In addition to the private production catalog containing clean images for its own use, Dorna Sports also maintains a public production catalog with watermarked content that can be accessed by outside broadcasters who are creating their own stories. Another large benefit of CatDV is its integration with industry-leading NAS and LTO storage solutions for streamlined archiving workflows. 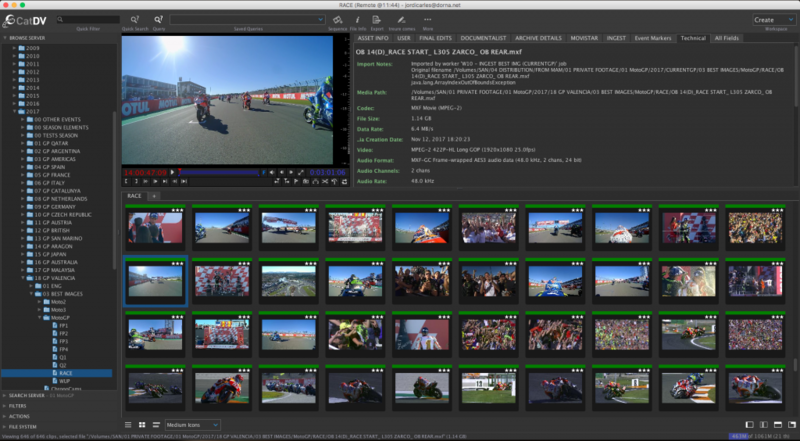 In Dorna Sports’ operation, CatDV links to the Archiware PreSTORE P5 storage system via a dedicated, fast archive plugin to create a seamless ingest-archive-retrieval workflow. Without having to leave CatDV, users can search for and retrieve any content archived in PreSTORE P5. “CatDV has been central to our ability to preserve almost seven decades of motorcycle championship history,” Carles says. “Right at the outset, we worked with Square Box Systems to import data files from our previous servers, and we’re now in the process of digitizing tape-based content going back to 1992 and importing it into CatDV. We currently have about 2 million assets, and growing, under management by CatDV and archived in PreSTORE P5. Looking ahead, Carles sees CatDV as instrumental in Dorna Sports’ continued movement to cloud-based archiving. CatDV’s cloud archiving components provide options for archiving to the leading cloud and object based storage systems. Dorna is planning to take advantage of these CatDV options to optimize storage across online, nearline, cloud and LTO.